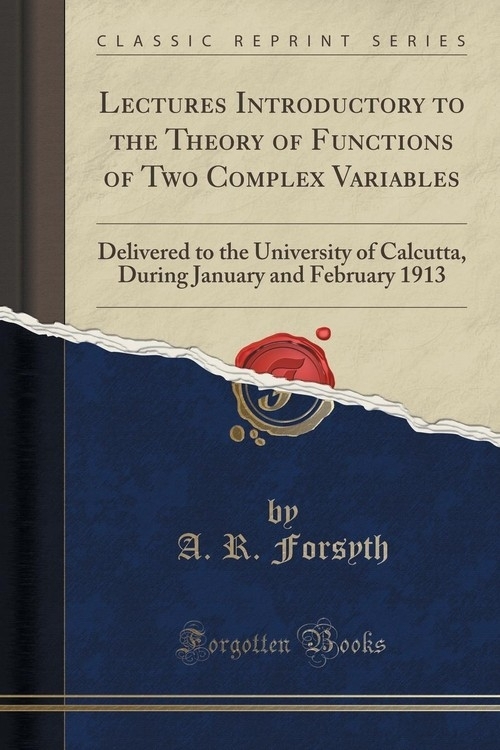 Opis: Lectures Introductory to the Theory of Functions of Two Complex Variables - Forsyth A. R.
This present volume consists substantially of a course of lectures which, by special invitation of the authorities, I delivered in the University of Calcutta during parts of January and February, 1913. The invitation was accompanied by a stipulation that the lectures should be published. As regards choice of subject for the course, I was allowed complete freedom. It was intimated that the class would be mainly or entirely of a post-graduate standing. What was desired, above all, was an exposition of some subject that, later on, might suggest openings to those who had the will and the skill to pursue research. Accordingly I selected a subject, which may be regarded as being still in not very advanced stages of development, and into the exposition of which I could incorporate some results of my own which had been in my possession for some time. Owing to the limitations of the period over which the course should extend, it was not practicable to make the lectures a systematic discussion of the whole subject; and I therefore had to choose portions, in order to discuss a variety of topics and to indicate some paths along which further progress might be possible. Thus, instead of concentrating upon one particular issue, I preferred to deal with several distinct lines of investigation, even though their treatment had to be relatively brief. Szczegóły: Lectures Introductory to the Theory of Functions of Two Complex Variables - Forsyth A. R.
Recenzje: Lectures Introductory to the Theory of Functions of Two Complex Variables - Forsyth A. R.